I love to block things. It is so satisfying to see how the lace opens, how everything take its place and how the tension even out and your beautifully and carefully handcrafted new item come to life. When you bind-off your stitches, it’s often feature what I like to call “sad lace”. Lace knitting is gorgeous, some pieces are even epic. But right when it’s off the needles, it’s crinkly, wrinkled and not-that-pretty. But when you soak it, it blooms. And the true magic of lace only reveals itself once blocked. 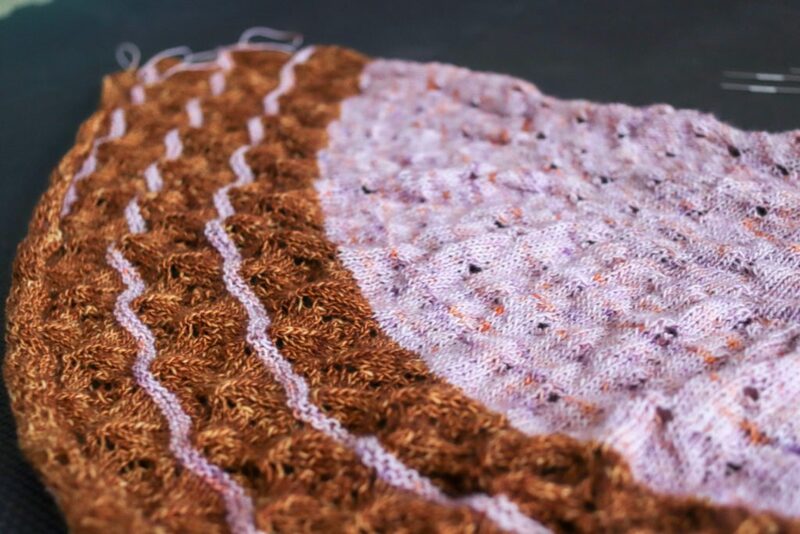 The pattern for this shawl should be out around the end of the month. As always, being a member of the Tisserin Brood is the best way to hear about it (and to get a chance to win a free copy of the pattern on it when it drops).